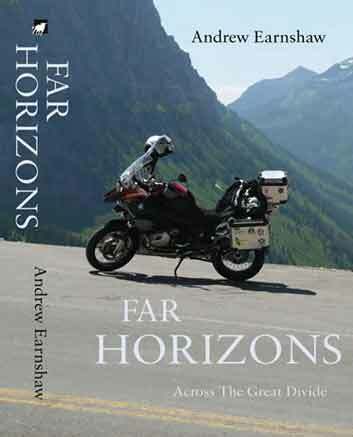 Far Horizons is a site that records our adventures travelling around the world by motorcycle. We've been incredibly lucky to be able to do this based, not on wealth, but on the fact that we are both contract workers and are self employed. The first long distance trip that I attempted covered ten European countries over a period of a month and was an entirely liberating experience. Following that I decided to try to ride around the world. Being not quite a spring chicken I thought it would be best to try and do this as gently as possible - making the attempt in three stages (three separate trips). The first commenced in May 2009 - a four month attempt to circumnavigate North America. My navigator and pillion passenger, Diane, joined me for a month of this trip. The result is blogged here. Whilst travelling in America I decided that the second stage should take me as far east as possible without hitting really tough roads. The target became Russia and in particular Volgograd. But I also wanted to visit Georgia. I don't really know why I wanted to go to Georgia, perhaps it was the lure of the mountains. This trip was different in that Diane would be coming along for the entire trip. 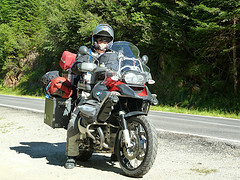 Whilst riding through Russia I was feverishly trying to complete my first book: 'Far Horizons: Across the Great Divide'. The first print run of the book is now available either signed via e-bay, on Amazon or through Troubador Publishing Ltd. Of course you can read the blog for free if you want to save a few quid, but you can't send it to a friend for Christmas and the book is much more fun. 'Far Horizons' is a big book so costs a little more than your average travel tale (it's about 2/3rds the size of the 'Lord of the Rings' trilogy), but differs in a few detail points: there is very little mention of Hobbits, only two battles are described and no film offers have been forthcoming thus far.